Scientists of the Max Planck Institute have reconstructed the first neuronal map of the visual system of marine annelids, gaining insight into the evolution of eyes. Larvae of the marine bristle worm Platynereis dumerilii orient themselves using light. Early in their development, these larvae swim towards the light to use surface currents for their dispersal. Older larvae turn away from the light and swim to the sea floor where they develop into adult worms. Scientists of the Max Planck Institute for Developmental Biology in Tübingen have discovered that this change in the behavioral response to light is coupled to different neuronal systems underlying the eyes. The scientists have reconstructed the first neuronal map of a visual system, from the input of the light stimulus up to the behavioral reaction – the directional turning of the swimming larva. 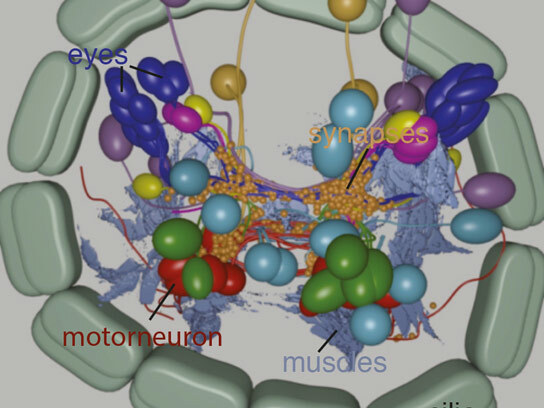 Using this neuronal map, the biologists can glimpse the evolution of vision. Phototaxis, the movement towards or away from a light source, is widespread among marine invertebrate larvae. During their development, many larvae switch from positive (movement towards light) to negative phototaxis. The underlying mechanism of phototaxis has to date only been described for the early larval stage of Platynereis dumerilii. Later in their development, the larvae develop additional eyes. With these new eyes comes the ability to switch between positive and negative phototaxis. “Instead of only swimming towards the light, the larvae often display negative phototaxis and swim away from the light”, said Gáspár Jékely, head of the research group “Neurobiology of Marine Zooplankton”. During the first two days of their life, the offspring of the bristle worm has the simplest eyes on the planet: On each side of the tiny head is a single photoreceptor cell together with one shading pigment cell. In 2008, Jékely and his co-workers from the European Molecular Biology Laboratory (EMBL) in Heidelberg discovered that this photoreceptor cell is directly connected to the larval driving engine, a band of cilia, a collar directly located below the headregion. When light hits the photoreceptor cell, larvae propel ahead in spirals, always towards the source of the stimulus. 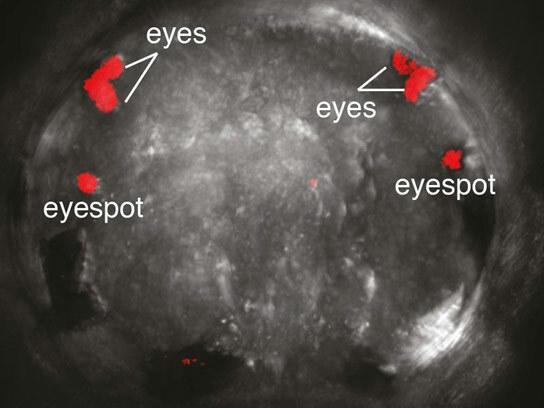 However, after 3 days of development, these simple larval eyes no longer mediate phototaxis.. At this stage, two pairs of more sophisticated eyes appear on the upper side of the head – the precursors of the adult eyes. These new eyes consist of several photoreceptor cells, a pigment cup and even a simple lens. Moreover, a simple neuronal network develops that processes and transduces light stimuli. The scientists in Jékely’s team studied this neuronal network in a greater detail using an electron-microscope. In a detailed map of the visual neuronal network of a 3 day old larva they identified 71 neurons that are connected by more than 1000 neuronal connections, so-called synapses. The scientists found that the light signal is still transmitted to the cilia, but now it also reaches the larval body musculature. Moreover, the eyes from the two body sides are also connected at the neuronal level. “We could show with behavioral experiments that the light stimulus activates the body musculature in such a way that it causes the larva to turn away from the light”, says Nadine Randel, first author of the study. During the experiment, the 3 day old larvae swam in a transparent container and were illuminated only from one side. As a result, the larvae bent their body and swam in a curve away from the light. The scientists also pharmacologically blocked the neuronal communication between photoreceptor cells and musculature. Although these treated animals could still swim normally, they no longer reacted to the light source. The neuronal connections between the eyes on either side of the body are required for spatial resolution. Additionally, the scientists could identify certain neurons, which block the signal of the photoreceptor cell from the opposite sides of the larva. “This enhances the contrast between light and dark and improves phototaxis”, explains Randel. For the first time, the developmental biologists from Tübingen describe a complete neuronal network of a simple visual system from the stimulus to the behavioral output. They also further gained deeper insights into the evolution of eyes. The simple eyes, which mediate phototaxis in the early larva, consist of two cells corresponding to Charles Darwin’s idea of the “proto-eye”, the precursor of all existing eyes. The four eyes which appear in the 3 day old larva represent an advanced form of this proto-eye principle. “It is as if we could observe several steps of eye evolution in a single animal”, says Jékely. “We think that the first eyes probably evolved to perform phototaxis – later, eyes evolved that could recognize objects”. Probably, the first simple eyes in evolution could merely discriminate a bright from a dark field. Such eyes might nonetheless represent the starting point for the evolution of more complex visual systems, as for example the human eyes. 1 Comment on "Visual System of Marine Annelids Provides Insight Into the Evolution of Eyes"
“Phototaxi”, “chemotaxi”, and “thermotaxi” are the three basic movements in the development stage of any living being in nature. When “phototaxi” in the larval stage is the precursor of development of eyes, we should know that “thermotaxi” is the phenomena through which the sperm travels towards the egg for life formation. Also “chemotaxi” is the method by which hormones reach their target organs for activation. Thus there is a blueprint in the life sciences for all these processes for activation of the end result. Thank You.